Ion Development announces that Lime Street, its £39 million mixed-use development in Liverpool, hit an important construction milestone in reaching its full height which was marked with a topping out ceremony led by the scheme’s building contractor, ISG. Further to groundbreaking in September last year, construction of the scheme continues to make good progress in delivering the city a new landmark development of mixed leisure, including over 28,000 square foot of retail and leisure space, a 412-bed student block and a 101-room Premier Inn hotel. Work has been underway erecting a 1,300-tonne steel frame to create the 11-storeys of student accommodation and a three-storey hotel. The team worked with Billingtons to source 100% British steel for the development. 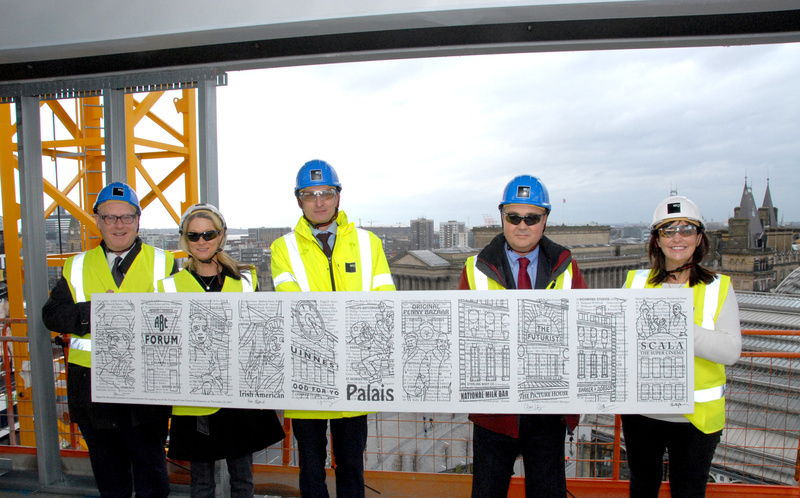 To mark the topping out, attendees signed a canvas print of the images which will become the façade of the building – a quantum timeline of Lime Street’s illustrious history as portrayed by renowned Liverpool artist Anthony Brown. Attendees included Liverpool City Council’s Deputy Mayor, Anne O’Byrne, Ion’s managing director, Steve Parry, Curlew Capital’s head of investment management, Ian Scott and ISG’s regional director, Paul Munro.